Radiology technician Ramona Getz adjusts the new mobile digital x-ray machine in the new state-of-the-art trauma room at Kelowna General Hospital during a demonstration Thursday. The room was equipped thanks to a $1 million gift from the Charles E. Fipke Foundation. Photo courtesy of Kelowna Capital News. With a $1-million gift from the Charles E. Fipke Foundation, a new state-of-the-art trauma room is saving lives at Kelowna General Hospital. 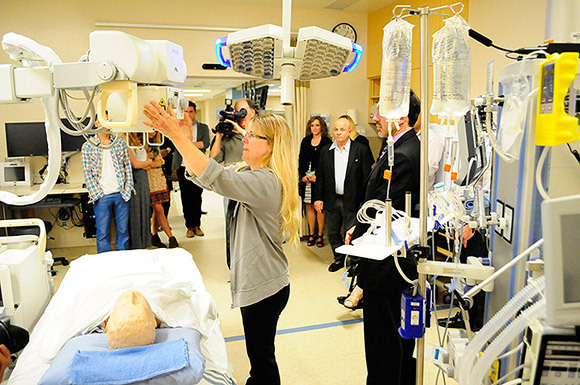 Supporting excellence in patient care and medical education, the new advanced trauma room will benefit patients, staff at Kelowna General Hospital, and the UBC Faculty of Medicine Southern Medical Program. The donation, made to UBC in partnership with the Kelowna General Hospital Foundation, allowed for the purchase of specialized airway ultrasound, and digital imaging equipment as well as equipment for a hyper/hypothermia system. The system has the ability to warm trauma and hypothermia patients at a controlled rate but can also provide cooling therapy for cardiac arrest patients with precise temperature control. “I was inspired by the quality of doctors at Kelowna General Hospital and wanted to give the emergency department’s medical team the best trauma unit in Canada. And I want to encourage others to give also,” Fipke says. Inside the new trauma room there is a digital radiology system—a portable, wireless, flat-panel system that provides great flexibility in capturing X-rays and delivering the images significantly faster than other systems. The trauma room is a learning ground for Southern Medical Program students at UBC’s Okanagan campus. Dr. Allan Jones, Regional Associate Dean, Interior says Fipke’s gift will not only help doctors at the hospital, but the current and future UBC students. The advanced trauma room is also equipped with a resuscitation cart, respiratory cart, and difficult airway cart. Last year, some 64,000 patients were cared for in the KGH emergency department and about 17 per cent of them required the advanced level of care provided in a room like Trauma 3.